196 pages | 1 B/W Illus. As scholars and administrators have sharpened their focus on higher education beyond trends in access and graduation rates for underrepresented college students, there are growing calls for understanding the experiential dimensions of college life. This contributed book explores what actually happens on campus as students from an increasingly wide range of backgrounds enroll and share space. Chapter authors investigate how students of differing socioeconomic backgrounds, genders, and racial/ethnic groups navigate academic institutions alongside each other. 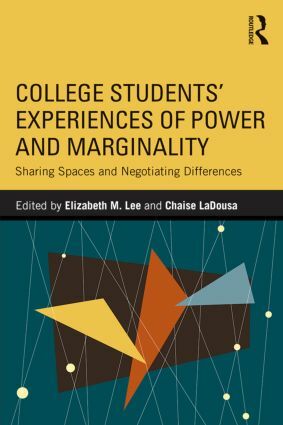 Rather than treat diversity as mere difference, this volume provides dynamic analyses of how students come to experience both power and marginality in their campus lives. Each chapter comprises an empirical qualitative study from scholars engaged in cutting-edge research about campus life. This exciting book provides administrators and faculty new ways to think about students’ vulnerabilities and strengths. "Lee and LaDousa’s important and well-edited volume brings to light the experiences of students who embody ‘diversity’ through insightful and nuanced qualitative accounts. Each account provides a unique window into students’ highly varied experiences at college and the complex interplay of forces that shape relations of power and emergent forms of marginality on college campuses. The compelling stories brought together in this volume vividly illustrate the deeply contextual nature of how ‘diversity’ is produced, negotiated, and experienced in institutions of higher education in America. The volume should be required reading for higher education administrators and faculty, and will be a valuable resource for all who seek to understand and truly confront the forms of power and marginalization that underlie the deployment of diversity policies in higher education today." "College Students’ Experiences of Power and Marginality takes a long overdue look at the full diversity of students who occupy today’s college campuses. This rich compilation by leading scholars of race, ethnicity, gender, sexuality, and higher education gives readers insight into how students understand and manage their positions in complex status hierarchies—as well as the costs of pervasive inequalities." Elizabeth M. Lee is Assistant Professor of Sociology at Ohio University. Chaise LaDousa is Associate Professor of Anthropology at Hamilton College.